"This recipe is simple, refreshing, and easy to adapt to suit your specific tastes!" Bring water and quinoa to a boil in a saucepan. Reduce heat to medium-low, cover, and simmer until quinoa is tender and water has been absorbed, about 12 to 15 minutes. Spread quinoa onto a baking sheet and cool to room temperature, at least 30 minutes. 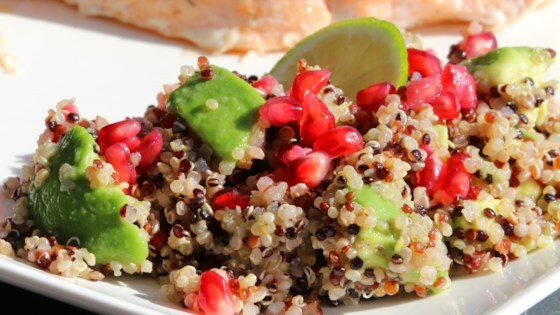 Transfer quinoa to a large bowl and gently fold in avocado and pomegranate seeds. Drizzle olive oil over quinoa mixture and toss to coat; mix in cilantro and lemon juice. My first review ever as I had to say how good this salad is! Made it just as written, no need to change a thing! Delicious fresh dish! Makes a great side for a picnic or other get-together. YUM. I made it as written except I had a ripe mango which I added. Easy to make - I had a pomegranate and an avocado, but didn’t even think of pairing them. Thanks for the idea!!! This is pretty tasty. "To taste" meant a lot more pomegranate in my life. I had to add salt, too.